Pagan Holidays: Not Sin…But Still “Wrong” or Helping Enemy? Isn’t it better to try to encourage our fellow believers to wake up and ‘take the red pill’ so to speak (obviously abiding by the biblical principal to be ‘ready to give a reason…’ as opposed to banging down a closed door) regarding the true origin and meaning of things including the man-made traditions that are now considered righteous and holy and “of the Lord?” So that they have a better chance of not believing the great delusion that will be offered at that time. To my husband and I, these traditions ingrained in the Christian “way” that are clearly not Bible-based but pagan-based are all part of a well devised and well executed master conspiracy authored by the father of lies and therefore, should be treated a little more seriously as such. Does that make sense? I just value your opinion and appreciate the method you have used in the past to arrive at answers to biblical questions and was hoping to understand a little better what your view is on all this stuff. I doubt many mainstream Christians can relate to the questions and concerns expressed above. Because I went through not only my Torah keeping and conspiracy theory phases, I understand it all too well. I’m also familiar with the thinking that although something may not be sin, it could still be somehow “wrong” and need to be avoided. Some Torah keepers use this logic. They won’t claim that Torah is required today, but they will suggest that if you “know” that it’s the “ideal” that God gave to Israel, “shouldn’t you want to do as much of it as you can?” Those who don’t see it that way are viewed as not true or not serious servants of God, guilty of “picking and choosing” what to obey in God’s Word. This judgment is usually not intentional or malicious. It is an effect of having high personal standards. We naturally think others should have the same standards we do in order to qualify as good people like ourselves. A naturally thin or exercise-loving person may view overweight people as lazy thinking that if he can keep himself thin, then everyone can and “should” do so, too (“should” is a word loaded with judgment). When it comes to instruction of the Bible, it’s easy to believe that its instructions are universal or God’s will for all men. Anyone opting out from any commandment of God must be disobedient. What these people miss is that good, sincere, diligent people come to different conclusions on what the Bible says. There are typically good reputable scholars on either side of any doctrinal dispute. The Bible is just written that way that multiple reasonable interpretations are possible. Until one recognizes that fact and as long as one keeps insisting that “the Bible is very clear” we continue to consider those who do not maintain the same standards as we do to be disobedient needing “to repent” instead of seeing them as the like-minded brothers who seek to serve God that they really are in God’s eyes. There are several differences in the topic at hand that make this principle inapplicable. First, when you see your neighbor’s ox wandering the street, you know it is out of place. You have the evidence; there is no disputing the fact. You must act or be guilty of negligence. However, the same cannot be said if you change the situation to someone merely reporting to you that your neighbor’s ox is in the street. Are they telling the truth or correct in their identification? Hard to say. It would be considered hearsay in front of a judge to claim that someone else said they saw the ox. You are far less accountable for that. Now take it a step further consider a situation where you are told that someone else is planning to open your neighbor’s gate so his ox can get lost. Not only hearsay, but this time hearsay about an intent to create a problem, rather than there being potentially an actual serious problem. This is more in the realm of rumor now. If you know the neighbor you might pass it along, but if they are just some stranger out there then it’s really not your concern. Chasing down wild rumors like that would not be a good use of your time. And that’s what these reports about the NWO planning to delude the entire world by inventing and encouraging pagan holidays are like. We have never met them, we don’t know who they are, we don’t know where they are or what they plan to do exactly or when. How can we be complicit in their evil plans by celebrating a popular holiday when all we have is hearsay and rumors to connect the two? Now, I concede that by not acting on even a rumor you might be considered negligent if it is regarding something serious enough, like someone reported to be conspiring to murder or physically harm others. For example, the Secret Service reportedly follows up on every single rumor of a threat against the President of the United States because of how important the president and his safety is. However, what we’re talking about here is “only” deception, and deception on the topic of holidays, no less. Whether it is part of some grand conspiracy does not matter. As stated above, this cannot be proven, and even if it’s true 1. it does not matter what was “intended” by those who started a tradition, but rather what is intended by those keeping it, and 2. we can’t be held accountable for knowing the origins of and intent behind every old tradition we keep anyway, even if it mattered, which it does not. Celebrating a holiday is not a sin. And truth be told, deception is not such a big deal either. We’re all deceived all the time thanks to Satan’s influence (Rev 12:9). We go in and out of deception as we study; picking up wrong information that stays with us until we discover it–if we ever do. Thankfully, we will be saved no matter how much false doctrine, tradition and beliefs we hold in our head and practice, even if those things are in alignment with the plans of evil people. Deception most often only hurts our pride, not our salvation. For this reason, “waking people up” about the pagan origins of holidays or supposed NWO conspiracy plans is not the biblical equivalent of the Matrix’s “red pill” that it is made out to be by many. For some it is noteworthy and leads them to discover that Christianity is not teaching them the truth but is teaching tradition.Â Yet they probably will remain Christian and keep believing the majority of the falsehood Christianity teaches contrary to the Bible. Adding or removing those beliefs of themselves does not change ones relationship with God. The majority, however, will view conspiracy theories from fringe sources or a history lesson on the pagan origins of some Christian traditions as not things profitable to focus on or change their life around. Who wants to serve a God who would expect you to be accountable for rumor-level information and things done or intended by people long ago in history? I know some people deep into conspiracy theory research will probably not be helped by the reasoning above. They will find it hard to let go of the idea that this secret “information” is not important or that it can safely be ignored. Perhaps it would help to know what the real “red pill” awakening is. It’s called the gospel of the Kingdom of God. When Jesus came this was the message he taught to the masses–not that he was the Messiah and people had to accept him as such to be saved. He taught them to repent because the Kingdom was being offered to those who do. Those who are called, chosen and faithful until the end will receive eternal life and entrance into the Kingdom where they will “inherit” and rule the earth for 1000 years. And not only that but blessings are promised in this life too (Mk 10:30). If you still doubt the above, it might help to ask yourself why with all the warnings Jesus gave about avoiding things, he spent ZERO time talking about avoiding pagan influence and conspiracy of the Roman culture and powers of his day dominating his nation? Instead, he emphasized love as the focus, not avoiding all these traditions and inventions of men. You’re safest if you follow his teaching rather than the rantings of fringe sources on the internet today. This War: Is God In Control or Just Evil? God is in control but has given us free will to choose how to live the life he gave us. He cannot give us free will then take it away everytime someone might do something hurtful or how would we ever learn it does not work for ourselves as freewill promises? That deaths and wars happen is solvable later becuase there is a resurrection and a time coming when God will rein things in to show the contrast of life under his government. But he could not “shove his religion down our throat” first before letting the need for his ways and government be historically demonstrated beyond any doubt. He will literally be saving the Earth from destruction when he steps in, proving our gift of life from him is incomplete without his instruction and government. If you want more insight on why God is allowing the world to go the way he is now, including all kinds of fractured warring Churches operating in his name, see my book Mystery Of Disunity. Why Do People Use Yahweh, Jehovah or YHWH instead of Lord? Why is everybody suddenly calling the LORD YHWH? If His Son, Yahusha, came in His Father’s Name, why would you still use “Jesus”?? There is only one Name under heaven by where we are delivered (saved). It is not “Jesus”. “Jesus” only means salvation. Yahusha means Deliverance of Yahuah or “Salvation” of Yahuah. Yahuah’s Son was not greek, ieasus, or Americanized jesus, He was a Hebrew and His Hebrew Name is Yahusha. In response to both I wrote a new article here on Yahweh vs. Lord and does God get mad if we say Jesus instead of “Yahushuah?“. More important than the number of the beast is the NAME of GOD!! Both old and new Testaments state that whosoever calls on the name of the LORD shall be saved. The saviour said he came in his fatherâ€™s name. So he has the same name as the father. What do you think the correct name out of the many expounded is? And how do we ensure that it is correct???? Any help on this issue would be appreciated. Thank you very much. 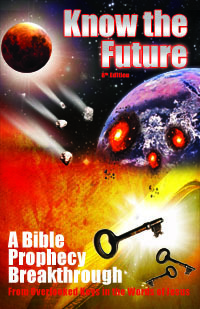 This topic is covered in great detail in my first book Planet X in Bible Prophecy, including the verses you cite of Joel 2 and Acts 2 about calling upon the name of the lord to be saved which are amazing prophecies of the future final fulfillment of the Biblical Feast of Pentecost before the Great Tribulation at the coming of Wormwood at the 6th seal. But it really has nothing to do with knowing his name and pronouncing it as the cause of being saved, but to tell us an attribute of the people who will be saved, that they love God enough to find out and use his name (Psalm 91:14) and are under a prophet who has taught them exactly what it is and how to say it, just as Jesus did to his disciples (John 17:6,26). This is contrary to how religions then and today operate in replacing the name with Lord or Adonai or even forbidding learning and saying the name as Judaism traditionally has done. It is not about magic syllables you must know to save you, but part of the restoration of all things promised by Jesus to come with the End Times Elijah before his second coming (Mark 9:12). As for what the name actually is, what I state therein is that if we trust the Bible to be accurately preserved enough for doctrine then why do we not look to it to know Godâ€™s name which is written almost 7000 times as YeH-?-VaH (missing the middle vowel)? The reason is people have been taught that the vowels for YHWH were replaced by the scribes with the vowels for â€œadonaiâ€, or â€œlordâ€, but you can prove this is not the case at all by comparing the two words in Hebrew (an exercise my book takes you through). In fact, although in most cases in most manuscripts one vowel indeed has been removed to prevent the name from being accidently pronounced (against Jewish law) when read, in some of the oldest complete manuscripts the scribes apparently forgot to erase the vowel (in about 50 places). The vowel that appears there, â€œoâ€ (cholam), is consistent with the vowels used in all the names of the prophets, kings who have the first three letters of Godâ€™s name at the beginning (theophoric names) such as Jehoshaphat, Jehoshua, Jehoiada, Jehoram, etc. Of course you must remember that these are not good transliterations into english since there is no J in Hebrew and the letter there Yod actually makes the sound of â€œY.â€ This gives us â€œYehoVAHâ€ (accent on the last syllable), of course very similar to the classic transliteration of â€œJeHOvah.â€ I believe saying â€œYehoVAHâ€ is as accurate for Godâ€™s name as saying â€œDa-VIDâ€ (accent on last) is for King Davidâ€™s. But I cannot say for sure how to exactly pronounce either of them without a prophet arriving to reveal it to me. By the way, Jesus does not have the same name as the father. He came in or under his fatherâ€™s authority, which is the other understanding of what coming in someoneâ€™s name means. His original full name is Yehoshua the same name given to Joshua under Moses, which means â€œYâ€™hovah is salvation.â€ Yehoshua became shortened to Yâ€™shua due to the Jewish ban on saying the name of God which Yehoshua contains 3/4 of.